Click on the "+" to see answers. Questions/Answers will continue to be added, so please check back often. What was the planning process used for this referendum? Nov-Dec 2018 District Staffing and Programming Task Force to assess key indicators and considerations to better position the district to meet the needs of our students and to be able to recruit, hire and retain highly-qualified staff. DASD student enrollment continues to grow at a faster rate than previously projected. By 2025, enrollment at the elementary, middle, and high school levels is projected to exceed existing building capacity. Enrollment growth is projected to accelerate, with the District adding 1,000 more students by 2025, a nearly 30% increase. Common areas at the high school such as the cafeteria, kitchen, and library are undersized for existing and future student enrollment. Demand for gym space and athletic fields for district and community use continues to increase. Yahara Elementary School, DeForest Area Middle School, and DeForest Area High School need upgrades to provide flexible and collaborative learning environments that support today’s student-centered instructional practices and to improve safety and security infrastructure. Additional funding is needed to staff and operate the proposed new intermediate school and high school addition. What does the referendum include? Site plans to be posted soon! Why another referendum four years after the last one? In 2014, the District and Community Advisory Committee studied enrollment growth and school facilities. Student enrollment projections were based on data provided by Applied Population Labs and Springsted. As shown in the following graph, DASD has surpassed the projections at a significantly faster pace (purple "Actual" enrollment line). The 2015 referendum addressed the immediate need to address elementary school capacity, specifically at two of our oldest elementary schools - Eagle Point Elementary School and Windsor Elementary School. These two projects also addressed aging buildings, as Eagle Point and a portion of Windsor were over 60 years old and key building systems had reached the end of their useful lives. Technical Education and Agri-Science labs were also renovated and expanded to create state-of-the-art space for STEAM programming (Science, Technology, Engineering, Agriculture & Math). A Technology Education classroom at the middle school was also remodeled for STEM. At Yahara Elementary School, the main office was moved to better support a secured entrance. The project also included creating safer separation of bus and parent traffic. Is a referendum really necessary right now? The CAC studied both the existing conditions of our facilities and the enrollment projections for the district. Both of those were significant factors to their recommendation to the School Board to seek a capital referendum. They identified a number of costly facility conditions and ADA compliance issues. In addition, existing enrollment was already creating some pressure on school district facilities like the middle school and the future enrollment projected for 2025 would be putting significant pressure at all three levels from elementary to high school. How fast or slow those projections become a reality is often the most difficult to predict, but as was learned from the 2014 CAC’s work, the district is positioned to realize a significant increase in student enrollment and our current facilities does not have the capacity or is in the condition for that increase in enrollment. Finally, a construction project of this scope takes three years to complete from design to construction. The further out solutions (expanding facilities) are completed, the closer the District is faced with increased capacity issues. The District will need to address ADA compliance issues sooner than later, the aging facilities will continue to create issues and inefficiencies, and solutions will continue to cost more in the future. How long will this plan meet the district needs? 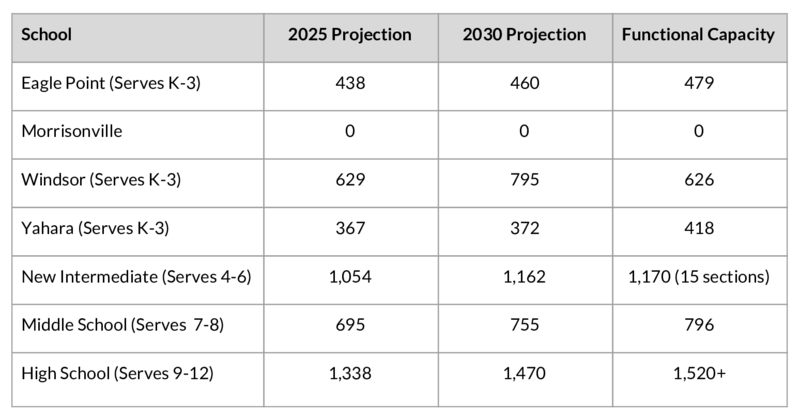 It is difficult to predict precisely, because a number of factors can influence school district enrollment growth, but what is being proposed does address capacity issues at the elementary, middle and high school for the foreseeable future based on current projections. It provides the district functional capacity for a more extended outlook particularly at the middle and high school levels. The CAC did identify that continued projected residential development in the southern part of the school district could create a need for an additional elementary around 2030. What are the enrollment projections and capacity per school with this facilities solution? 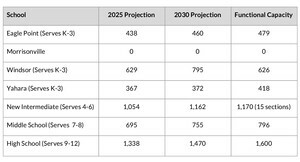 Below is a chart that shows proposed enrollment-capacity projections. Click on image for larger version. How much new space and renovation of space is included in this proposal? Why a new intermediate school and not a new elementary school? Was a new high school considered as an option? The CAC considered a wide range of possible solutions to address the long-term facility needs of the district and our growing enrollment. One of the early solutions was to build a new high school for 1,600 students and renovate to accommodate moving the middle school to the high school and the middle school to become an intermediate. The CAC determined this option was not cost effective as a new high school for 1,600 students, less a land purchase, was estimated to cost approximately $140 million just for the high school alone. The CAC decided to explore other more cost effective options that still met the identified needs. How soon will the new school and renovations be done? The entire project will likely take three years to complete, with some components of the project coming on line beginning in 2021 (see below). Why are we changing grade configurations? What is meant by flexible, modern learning environments? The learning facility and its infrastructure can play a significant role in helping students learn the necessary 21st Century skills, such as critical thinking, problem solving, collaboration, etc. Flexible, modern learning environments support integrated technology, dynamic collaboration, hands-on learning, transparency, and private/public partnerships. Flexible learning environments facilitate both small and large group instruction, in addition to regular classroom areas that allows for “student-centered” learning. Flexible spaces also have the ability to create smaller learning communities within a larger school. At the intermediate school, would grades be formatted the same as they are in elementary school (4th) and middle school? (5th & 6th)? District staff have not made any final decisions, because we really could do it either way across the building, or transition it over the three grade levels. Currently at the elementary schools, 4th grade students' core subjects are taught by one teacher in one classroom and move to other classrooms/teachers for specials (art, music, phy. ed.). Fifth and sixth grade students at the middle school currently are all located in a team pod, but move from teacher to teacher for their core subjects. Specials are treated the same with students moving to those classrooms/teachers. There are benefits to both grouping structures, whether it is stronger content specialty or stronger teacher relationships with a single homeroom teacher. District staff will be reviewing and weighing those benefits and challenges over the next several months after an approved referendum before making a final decision that would impact the overall design of the building. Teacher input would be sought for these decisions. Why close two buildings if additional capacity is needed? Both the Holum Educational Center and Morrisonville Elementary are buildings that present a number of compliance and infrastructure issues caused by the age of the facilities. In addition, both have site or structural limitations that make the cost to renovate or rebuild too costly. Why does the District need a new pool? The existing pool and adjacent locker rooms are quickly approaching or are at the end of their useful life. The structure and systems of the existing pool are beginning to fail or are beyond repair. Portions of the existing pool’s foundation have sunk creating issues with the filtration system and pressure on the structure. The existing pool at the high school is currently used for high school students (gym classes), DAHS Swim Teams, DFAC, Village of DeForest Park & Rec Summer swim lessons, and community lap and open swim. How will community access to pool, fields, etc. be enhanced through this plan? With the existing pool and north gym being remodeled and repurposed for other educational and school programming, a pool and three-station gymnasium addition will be built to recapture those facilities. This addition will be designed so it can be secured from the rest of the school to make it accessible for community use during the school day. Currently, the pool cannot be accessed by the public during the school day because of security protocol, despite the pool sitting vacant for portions of the school day. Securely sectioning off the addition will allow for community access and programming without any disruption to the high school day. Can other revenue sources be used to fund the pool? While that certainly is a possibility, that would likely be a post-referendum opportunity. A sponsorship could be explored if there are interested private or public organizations that could be utilized to reduce the amount borrowed or prepay debt. It is important to note that there have been both successful and disappointing examples of school district partnerships with private companies or municipalities around a pool project with a number of different factors contributing to those examples. Could the Villages and the School District build a community pool together? The Village of DeForest held a non-binding advisory referendum in November 2016 asking whether residents supported a tax increase to construct and operate a municipal swimming pool. 51.1 percent of DeForest voters opted in favor. Although we do work closely and collaboratively with our municipalities, our focuses are understandably different. We do engage in communications and try to be supportive of each other’s efforts. District and Village staff did hold preliminary conversations shortly after the advisory referendum. At this time, our District needs for an indoor competitive pool supporting our educational and athletic programming are more immediate, because the current pool’s infrastructure and systems are nearing the end of their useful life. Although the existing pool is heavily utilized by community groups and residents, a community aquatic facility would not align with district programming or use. It is important to note that the proposed new pool addition to the high school would continue to be utilized as it is currently, but will see an increase in community accessibility. The addition can be designed to allow the district to secure the pool from the rest of the high school during the school day allowing community programming to occur. This currently is not possible because of the challenges of maintaining security protocols at the high school. Will this referendum take care of the District’s capital maintenance needs? The capital project does address a significant amount of capital maintenance items, but does not address all of them. Annually the district budgets approximately $400,000 for capital maintenance projects to address larger items such as roofs, HVAC, etc. Projects are prioritized on the District's capital maintenance plan based on life expectancies and cost. Decisions are made yearly based on efficient use of staffing, budget, when buildings are not being utilized by school/community, and contractor availability. Several of the projects included in the proposed plan that were originally scheduled as part of the District’s capital maintenance schedule will be addressed with the renovations and improvements included in the projects at DAHS, DAMS, and YES. Taking HEC and MES offline eliminates the need to address the significant building issues of those facilities. The District’s New Phased Capital Maintenance Plan reflects the remaining projects, such as roofs, exterior lighting upgrades, asphalt maintenance, etc. The remaining capital projects not included in the referendum proposal requires an estimated budget of $9.9 million. The District has created a six-year plan that addresses the remaining items using the annual maintenance budget and maintenance reserves during that time span. Why close Morrisonville Elementary School and Holum Education Center, and what will happen to those buildings? Although Morrisonville Elementary (MES) and the Holum Education Center (HEC) have served the district well over the years, both buildings present significant issues including ADA (Americans with Disabilities Act) compliance, failing infrastructure, systems at or nearing their useful life, and safety violations. As examples, ADA issues at MES include entrances and access between levels of the school that are not compliant, restrooms that are not compliant, and hallways that do not provide adequate clearance for individuals utilizing motorized wheelchairs. Similar ADA compliance issues exist at the HEC including accessibility between the two levels of the building. Both facilities have infrastructure and systems that are very inefficient or consistently failing and in need of repair with parts becoming increasingly more difficult to find. Although some of the issues are “grandfathered”, many of those concerns do not meet today’s safety and security standards. The cost of addressing these significant updates would not be cost effective considering the age of the facilities and the number of students and staff it serves. Both buildings will be put up for sale. The proceeds will be used to offset the costs of the projects. What school will MES students attend? The proposed plan includes closing of the 100-year-old Morrisonville Elementary School. Relocation of these 62 students has yet to be determined and will require further study of the MES attendance area. Likely students will go to YES and/or EPES. Why are athletic sites included as part of the proposed facility upgrades? DASD facilities, including athletic fields, are used extensively by the District and community. A recent analysis showed a number of limitations relating to the condition and use of existing facilities, including significant ADA (Americans with Disabilities Act) compliance issues. How does the proposed project at the middle school address the mold found at the middle school? The mold has now been remediated at the middle school. The new project will however assist in refurbishing the spaces that were damaged by the mold and mold removal. Why is there a need for additional support for operational staffing and programming? A recent Task Force (25 individuals representing staff and community) has identified a deficit in our staffing levels relative to our peers who offer programming that support students and teachers that DASD is currently not able to provide. They identified a tremendous opportunity to improve student achievement by strategically implementing and adding specific staffing to support those potential programs. Currently, our district operates with a per-pupil revenue limit that results in approximately $3 million less of revenue compared to the Dane County average. Operational staffing and programming - what does it mean? This means strategically hiring staff to either enhance existing programs or develop new programs to improve the level of services provided to students and teachers with the intent of improving student achievement. This could include supports to build teacher capacity or added staffing in areas of specific student need. This also means ensuring DASD salary/benefits remains competitive in an increasingly competitive employment market. What is the District’s current financial status? DASD has earned a AA+ Standard & Poor’s bond rating for several years. Only 16 districts in Wisconsin have the same or higher credit rating. The rating counsel uses several indicators to assign credit ratings to districts. In order to obtain this rating the district had to demonstrate the following: strong stable economy, increasing enrollments, strong financial operations paired with good financial management practices, moderate market value debt, and high per capita debt ratio. Having a strong rating helps to secure lower interest rates for future bonds (borrowing). What are “revenue limits” and how does DASD’s revenue limit per member compare with other Dane County schools? The Wisconsin legislature implemented revenue limits beginning with the 1993-94 school year. A district’s revenue limit is the maximum amount of revenue that may be raised through state general aid and property tax. The difference in DASD’s revenue limit compared to the Dane County average is $887.99. With our 3,636 students, that equates to $3,228,732 less revenue annually than half of our Dane County peers. 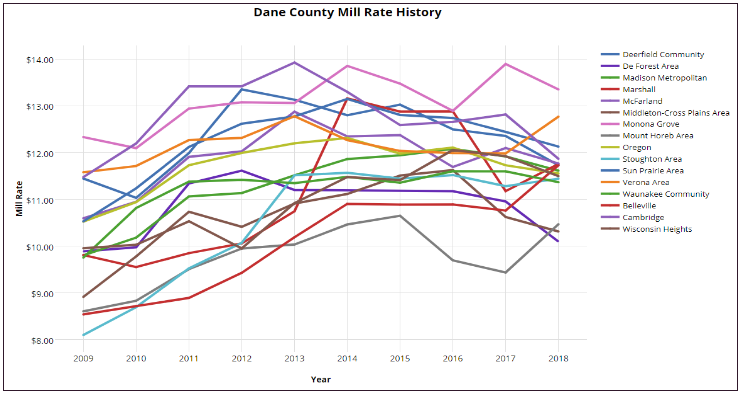 What are “mill rates” and what is the history of mill rates in Dane County and for DASD? Mill rate is the amount of tax payable per dollar of the equalized value of a property. It represents the amount per $1,000 of the equalized value of property, which is used to calculate the amount of property tax. 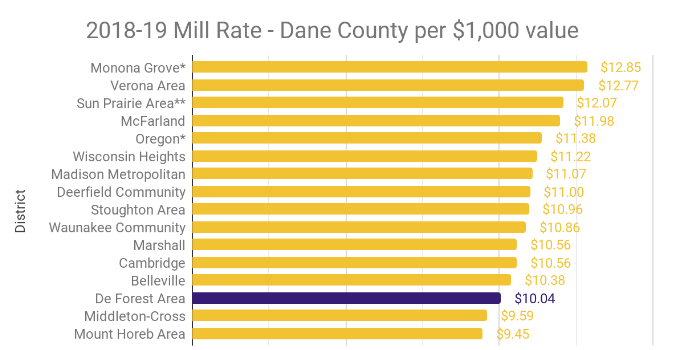 In 2018-19, DASD has one of the lowest mill rates in Dane County. Historically, DASD has been average to below average compared to their Dane County peers. Please note that the chart below is for 2017-18. What assumptions were made when estimating the tax impact? Similar to the 2015 Referendum, the District’s financing plan calls for 20-year borrowings phased in over a 3-year period with planning interest rates of 4.50%-5.00% for a total repayment period of 22 years. As of February 15, 2019, Wisconsin School District borrowing interest rates were approximately 1.00% lower than the conservative planning estimates used to calculate the mill rate impacts. If interest rates remain low after the referendum, the district would be able to significantly reduce the interest cost related to the borrowing and could reduce the estimated tax impact. Each 0.50% reduction would reduce the interest cost by over $7.5 million. Additional scenarios are provided below to help demonstrate how growth based on DASD historical trends can reduce the tax impact. Estimated mill rate impacts are based on the 2018 Equalized Valuation (TID-OUT) of $2,636,300,548 with conservative annual growth of 3.00% for two years, 2% for two years, and 1.00% thereafter. DASD property value growth for the last three years were: 2016-17 10.15%, 2017-18 8.15% and 2018-19 9.36%. Additional scenarios that demonstrate how growth based on DASD historical trends can reduce the tax impact. How will the operating referendum be used to reduce the building project costs? If the proposed operating referendum passes WITH the capital referendum, the district could use the first two years of the building operating dollars (a total of $3 million) towards reducing the level of borrowing needed. This is estimated to reduce the tax rate impact by $0.09/$1,000. Does the district anticipate any current bonds being paid off in the near future? The district does have two bonds that will be paid off in the next few years. In April of 2020 the last of the refinanced bonds from pre-2014 will be paid off. In April of 2021 one of three bonds of the 2015 referendum will also be paid off. These amounts were factored into the estimated bond payments for the proposed 2019 referendum bonds. What is fund balance? Why is it needed? Although the term is used to describe a number of things, a fund balance is the difference between assets and liabilities. When assets are greater than liabilities, the balance is positive. A fund balance can include both cash and non-cash items. For example, the school board might commit $200,000 of cash reserves to repair a school roof. The amount is still included in a district’s balance, but it cannot be used for other purposes. The fund balance is a snapshot in time and is usually measured at the close of the fiscal year. Similar to your checking account, balances fluctuate from month to month. Why is a fund balance needed? Just as an individual or family should maintain a savings account for unforeseen expenses or emergencies, school districts should also have funds in reserve to pay for emergency repairs or unexpected changes in revenues. Fund balance can also be used to offset year-to-year variations in local or state cash flow, such as a delay in payments from the state. Each year, the school district faces this as it starts the school year. The fiscal year begins on July 1st; payroll expenses for the new year begin, initial supply orders arrive, and there are many “back to school expenses.” However, aid payments from the State do not begin until September. So, school districts across Wisconsin either borrow money or utilize the cash portion of the fund balance. In addition, fund balances enable districts to generate investment income rather than pay interest expense. Fund balance is also recommended to guard against an economic downturn. It is also advised that a fund balance is necessary to meet emergency situations, which could include: uninsured loss, major repairs to heating systems, and replacement of damaged educational equipment prior to scheduled change. The percent of fund balance to expenditures is also considered when the district is being reviewed for a credit rating. What is meant by a “financial disadvantage" relative to Dane County peers”? In the simplest form, a school district budget can be broken down to a revenue limit per pupil amount. Currently, our district operates with a revenue limit per-pupil amount that is $888 (per pupil) less than the Dane County average. This results in a financial disadvantage of over $3.2 million of operating revenue annually compared to the Dane County average. How can I learn more about the referendum? Each session begins with a presentation, followed by an opportunity to ask questions of staff. State law requires school districts to separate capital referendums and operational referendums into two distinct questions. In our case, it seems confusing because they can be viewed as interconnected with the construction of new space and the cost to operate them. It would not serve the district’s needs to have only one of the questions be approved. Residents should either vote “yes” for both or “no” for both. A split vote is effectively a “no” vote for both and would have a similar result for the district. How does open enrollment affect the district? Each year, the district makes choices about which grade levels to offer open enrollment. As an example, if a grade level is exceptionally large, we may not offer any open enrollment seats at that grade level. Because of this, open enrollment can be adapted to meet our needs. Over the past few years, open enrollment is about a “break even.” This means that just as many students leave our district as come in to our district. The last two years DASD has only accepted open enrollment students into 4K and at the high school. Will boundary changes be needed again? The Morrisonville boundary will need to be reviewed to identify the best school assignment for those families if a referendum is approved. Elementary boundaries could be reviewed and revised in the future as an interim solution to alleviate enrollment pressure before building another elementary school. How are contractors selected for the projects? The district did a RFP (Request for Proposals) and interview process in selecting our Construction Management (CM) firm for the facility study, to support the CAC planning, and to oversee the delivery of an approved capital referendum. It is in our agreement that the CM will competitively bid out the components of the project. How much vacant land does the District own and where is it located? The district currently owns approximately 65 acres on the property that Windsor Elementary School currently sits on. The land is currently being farmed as part of the school district’s student land lab that is managed by FFA students with teacher supervision. The district also owns 11.3 acres of property that wraps around the west end of Big Hill (see property map here). The Big Hill Environmental Center is an area rich in diverse plant and animal communities and habitat: wetland, prairie, oak savanna, and woodland. The remaining areas of what is known as the Big Hill are owned by the Town of Windsor. Since 2004 it has been a Wisconsin School Forest. The district also leases 14 acres from St Olaf's Church in addition to the the 53 acres the high school sits on. The St Olaf's property begins at the south end of the tennis court fencing extended to the end of the field. It is primarily used for our high school athletic programming. What is the status of the land that was available in Conservancy Place? The school district does not own land in Conservancy Place but did have an option to purchase the property. In 2014, it was determined that this piece of land was not adequate for a public school based on the number of acres required for an elementary school building and associated outdoor space and parking. Regarding 4K… Does DASD prefer to deliver it via daycare/preschools or house it in its own buildings with its own staff? The district is committed to our community partnerships for the 4K program and intends to continue with community-based partners for programming. What if the referendum doesn’t pass? The administration would request the School Board reconvene the CAC to regroup and review the results of the election and begin planning for a referendum in the Spring of 2020 (per recent State legislation, specific guidelines apply). Unfortunately, that would be the earliest we could engage our community again. The need to address the aging facility conditions and the impending pressure on our facilities caused by our enrollment growth will continue to exist. Additional challenges from a failed referendum will include increasing construction costs naturally caused by annual inflation and a year longer or more that our facilities are pressured by the enrollment growth. Where can I find voter information, including polling places and voter registration requirements? Here is a list of polling place locations and hours within the DeForest Area School District boundaries. Or, visit myvote.wi.gov to find your polling place or for more information on voter registration and photo identification requirements. Can I vote before April 2? You may vote early beginning March 11 up until the Friday before the election (March 29) at 5:00 pm. You will need a State of Wisconsin photo ID. You can obtain the ballot at your local municipal office during regular business office hours.